Contemporary Beach bathroom by Gen Ghaleb/XYContemporary for DXV. Lixil may not be a name you've heard before (that is, if you missed this post), but you are likely familiar with many of its brands. Lixil is a parent company banner for familiar names like American Standard, Grohe and DXV. And in case DXV isn't yet in your lexicon (tsk tsk tsk) the quick primer on that is DXV debuted in 2014 to celebrate the 15th decade of American Standard. DXV is a design-driven premium division of American Standard. 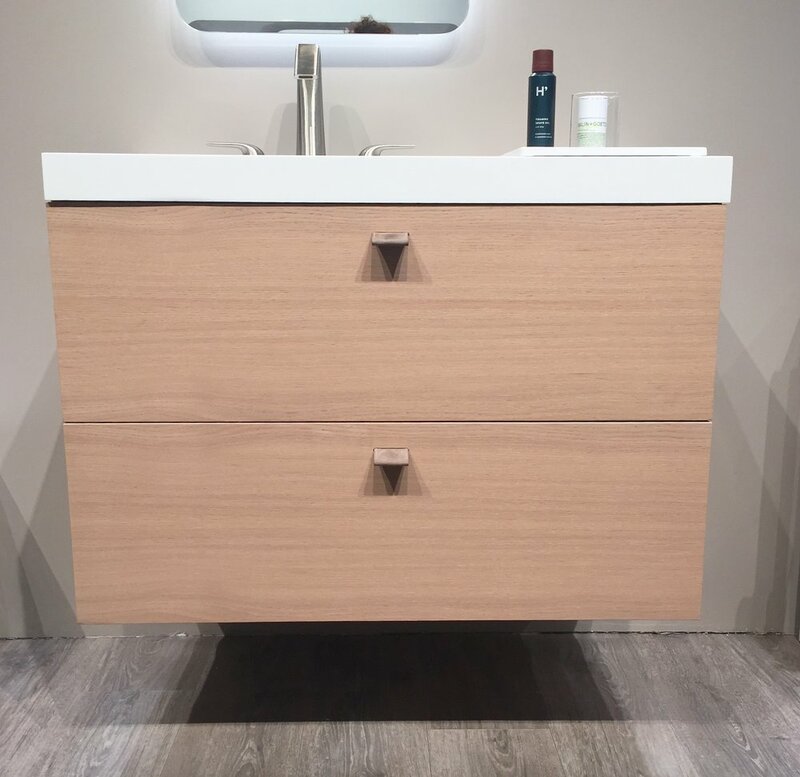 OK, now that you are up to speed, let me bring you The Design Edit picks from the Lixil brands exhibit at KBIS 2017. The Lyndon freestanding soaker tub is the true centrepiece of Gen's room. That stunner of a side table is another little dose of Canadian content, the Oldtown Stool by Hollis + Morris of Toronto. The serene space may be minimalist but is far from lacking in detail. Love the addition of artwork by Canadian artist Zoe Pawlak. And inside the cabinet on the right is a coffee station and wine fridge. Yasssss! Not only has Gen thoughtfully turned this shower into a space for two but she has also included this clever shaving sink right inside the shower. So. Smart. 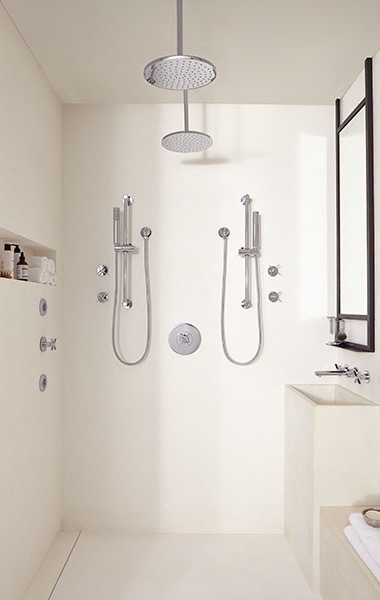 Percy Personal shower system with Contemporary 10in Round Shower head. Here's a closer look at the shaving station with the Percy Wall-Mouted Faucet with Cross Handles. This spectacular piece of technology is a toilet and bidet in one (It also includes an air freshener — not kidding). Meet the SpaLet AT200 toilet. To see the rest of the Design Panel 2016 designs, visit the DXV site here. The DXV Design Panel for 2017 was announced at KBIS. They are Michele Alfano, Corey Damen Jenkins, Kati Curtis and Canada's own Alison Habermehl. They've already started designing their spaces. Follow along on social media with #DXVDesignPanel for sneak peeks. I was pretty blown away by this new bathroom collection from DXV. It epitomizes one of the overarching trends touching kitchens and baths that I spotted at the show: customization. In so many realms of interior design manufacturers and suppliers are now offering designers and homeowners an entire menu of options so that each can tailor the final look to their own tastes. 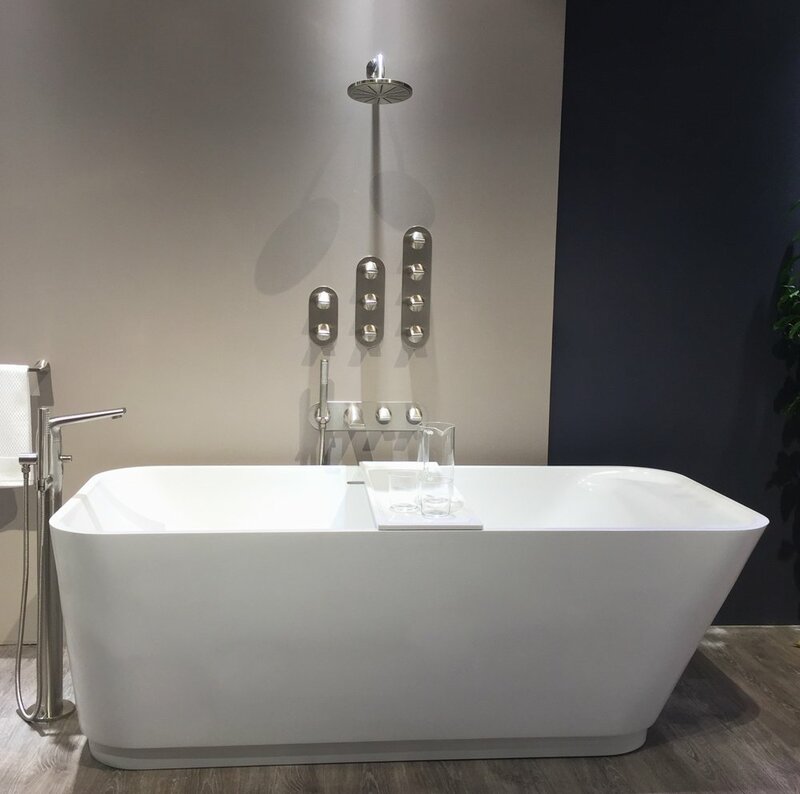 DXV has you covered in that regard with Modulus. Above, this long cantilevered sink counter with one drawer wall-mounted below is just one look for Modulus. The blond wood, leather drawer pull and matte black faucet are very now. This sink is made from solid surface material. Here's a closer look at Modulus. The sink includes this handy tray that acts as a dry zone without requiring additional counter space. Love the large drain cover. When not in use, the tray from the sink can nestle right on top of the wall-mounted drawer, which is kitted out with clever storage compartments. This faucet is a total beauty. Even though it has a sleek silhouette it feels soft and comfortable to the hand. Take a closer look at the base of the faucet. Do you see the faceted ring? Here's some super newsy news for you: that ring is a point of customization. The faucet comes shipped with a ring to match the faucet finish, but you can opt to kick things up a notch with one of these fancy pants designs. I confess I found them very hard to photograph. Here they look like they each have LED lights — they don't. That's just reflection. Rings come in white marble, matte black, faceted black, cross-hatched and more. Fun! In addition to solid surface material, Modulus sinks come in (from top) black marble, white marble and concrete. Gorgeous! This second Modulus vignette is pretty much exactly what I'd like to do in the Austin Suite bathroom. 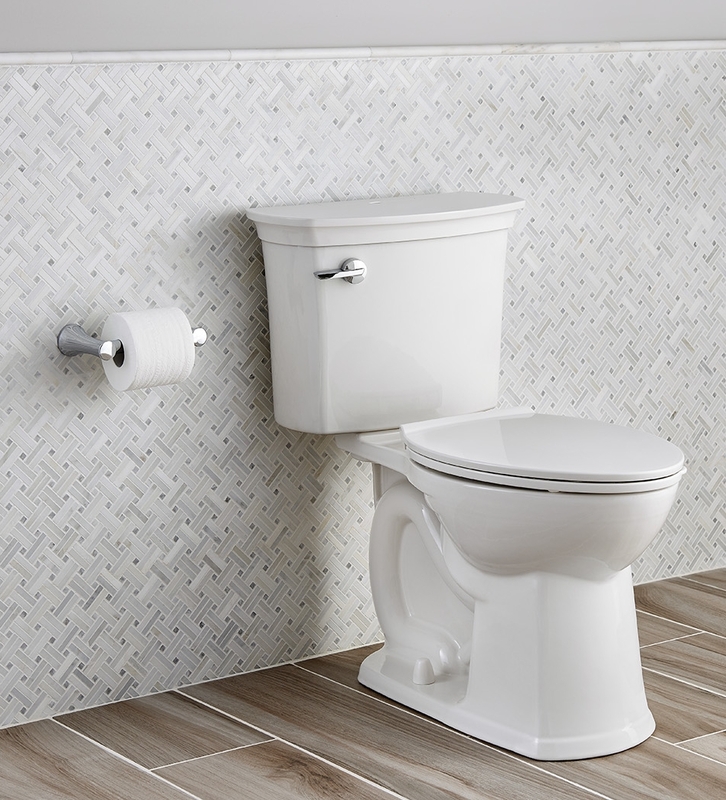 Love the added storage capacity of this wall-mount cabinet and this very chic toilet. This version also features the movable tray. Here's a closer look at the cabinet. It is fitted with pulls made of leather from a watchband factory. There was simply no avoiding the fact that wall-hung toilets are the biggest design news in the category. This one and its matching bidet are perfect. When a wall-hung toilet isn't possible this one is at the ready. I love its monolithic look. The soaker tub is a dream and the tub filler and shower system have levers that feel great in the hand. 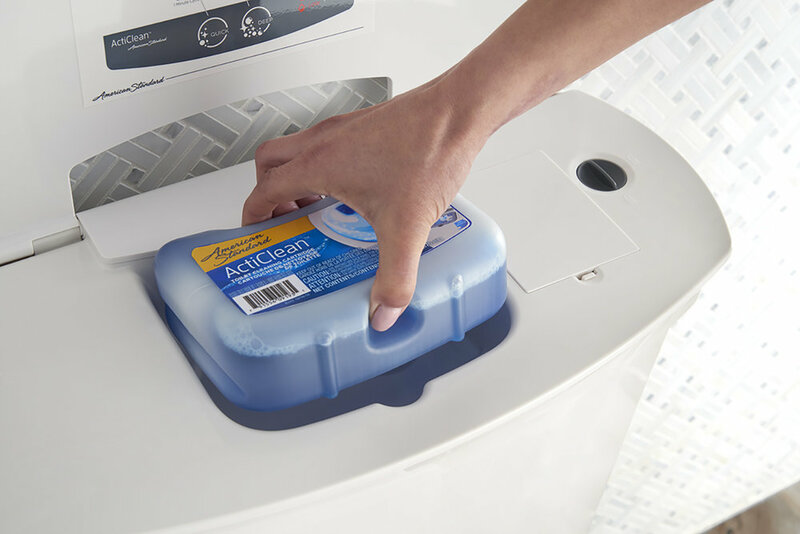 The American Standard ActiClean toilet seemed to be one of the most buzzed-about products of the show. To summarize: it's a self-cleaning toilet. Well, actually, you do have to press a button. But that beats the heck out of those stupid brushes right? Praise be! The smart birds at AmSt enlisted noted germophope Howie Mandel as the pitchman and he took his duties very seriously (sadly I did not meet him). This product is a natural for him and reportedly he is pushing the brand to develop even more great products to appeal to all of our inner germophobes. Keep up the good work folks! This clever MeasureFill faucet from American Standard is so new that it won't even be available until later this year. It includes a selector for popular measures in ounces or cups. You just set the selector for the amount of water you need, touch the faucet to turn it on and it dispenses precisely the set amount and then turns off. So handy. 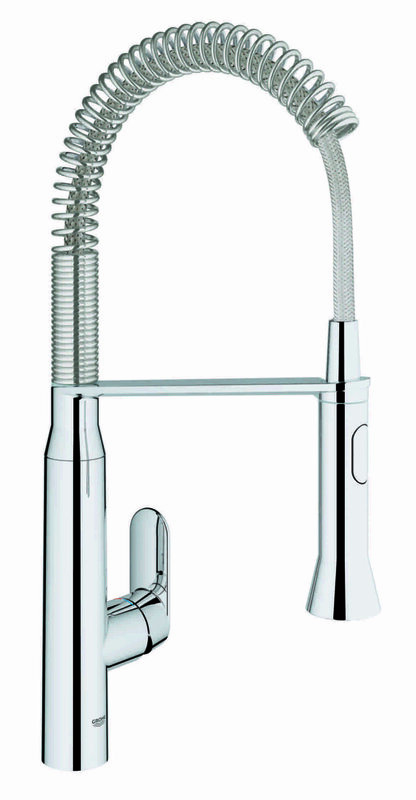 When not needed to dispense specific measures, the MeasureFill functions as a regular single-handle faucet with a touch control option. Speaking of clever, the new K7 from Grohe includes a convenient Foot Control feature. Just wave your foot in front of the sensor at the bottom of your sink cabinet to turn it on and off. Truly handsfree. The Grohe Essence Semi-Pro faucet was probably the most photographed and social media'd faucet of the show thanks to this fun display. Attendees were asked to shoot and post their favourite colour, then give it a name for a chance to win the faucet. My favourite was the black. Haha, typical Margot. Ok fine, green or yellow. Grohe SmartControl RainShower. Photo by Felix O.B./FXO Photography. The Grohe SmartControl RainShower operates with the simple push of a button. (And it includes a small handy shelf right on the riser). 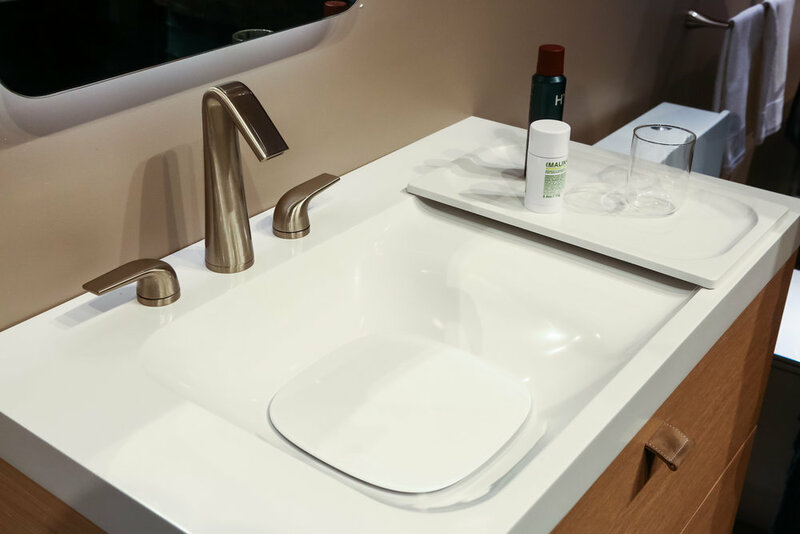 You already got a little sneak peek of the Lowell collection by DXV when I told you about the Morning with Lixil event from a couple of weeks back. Please enjoy it again. So pretty. Love the wood and leather combo on the console and the styling is quite lovely here too. My trip to KBIS 2017 in Orlando, Fla was partially sponsored by Lixil brands. Special thanks to #BlogTourKBIS organizers Modenus/Design Hounds. The ideas, words and design of this post are all my own.